CLACKAMAS — On the first offensive play of Friday's game, Newberg quarterback Gage Wright turned around and faked a handoff to … nobody. He was subsequently sacked at the end of a broken play, an ominous sign of Newberg's struggles to come. The No. 31 seed Tigers fell 48-0 to No. 2 Clackamas in a class 6A first round playoff game at Clackamas High School. 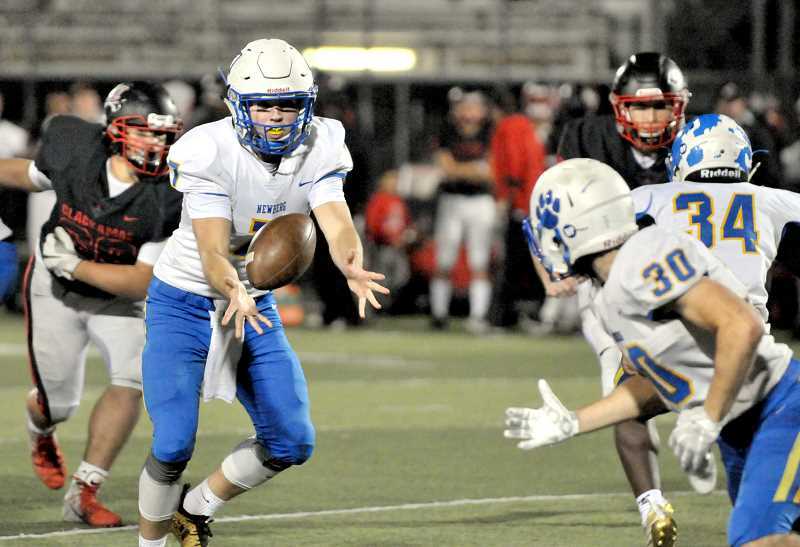 Newberg relied on a stable of running backs to replace the injured Justin Holtan, and the group was never quite able to break out and get in the end zone. Laurence Lundgren, Matt Larson, Dwayne Buck, Armen Tarakhchyan and Connor Croskrey all carried the ball for the Tigers. "We played a great team tonight," NHS coach Kevin Hastin said. "It's good for our young guys to see the level we want to be at. It was a great experience and I wish we competed a bit better, but we had some guys banged up from last week." The defending 6A champion Cavaliers showcased their athletic superiority throughout the game, particularly when they had the ball. Playmakers at the skill positions burned past defensive backs, find soft spots in coverage and overpower Newberg defenders. Clackamas's first score of the game — a 46-yard catch and run by Richard Kennewell late in the first quarter — broke the seal after a slow start by the Cavaliers. "We made some good plays in the passing game — some explosive plays," CHS coach Joe Bushman said. "I thought our quarterbacks did a good job when the plays broke down. They made some positive plays and some nice throws. We have two good athletes back there, and that's nice to have when things don't go as planned." Were it not for a muffed punt that allowed Newberg to chew up the clock on the opening drive of the game, Clackamas might have tallied a lead greater than 7-0 after one quarter. Bushman's team lit up the scoreboard in the second quarter, however, extending its lead to 35-0 at the half. The Cavaliers scored their second quarter touchdowns on 49- and 37-yard catches by Jailen Hammer and Jack Dollens, respectively, along with a pair of scrambles by quarterbacks Austin Atkenson and Caleb Jordan. Atkenson and Jordan displayed elusiveness behind and beyond the line of scrimmage, and they were both accurate through the air. With many of its reserves in the game late in the third quarter, Clackamas scored on a 10-yard rushing touchdown by freshman Cole Prusia before missing the extra point, making it 41-0 through three. The final touchdown came on a five-yard pass from Atkenson to Jake Bushman with 10:13 remaining. "Before the game, we'd been practicing hard all week," Atkenson said. "We just came off a good win against Central Catholic and so our practice habits paid off tonight." Next week, the 10-0 Cavaliers will host No. 15 seed West Salem — fresh off a 57-28 drubbing of No. 18 seed Southridge. 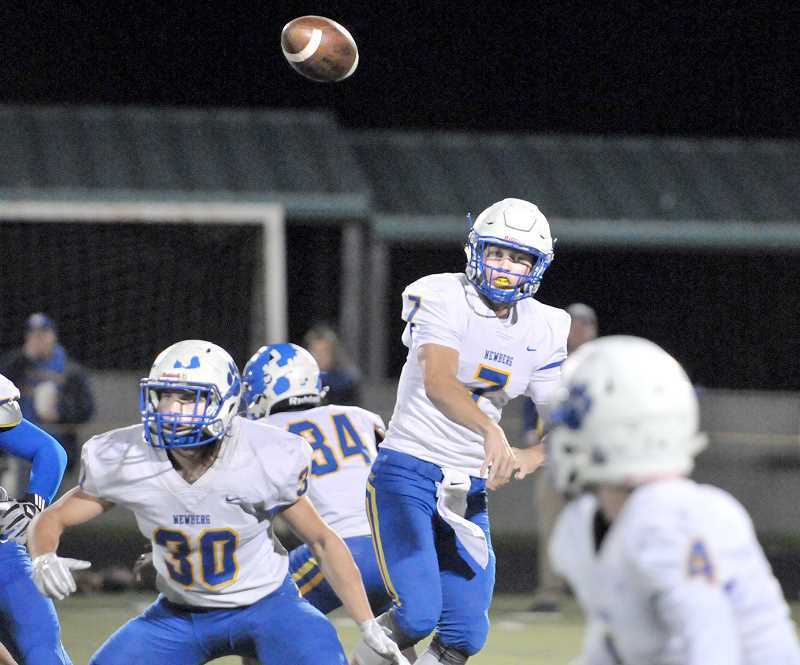 Newberg, meanwhile, ended its 2018 season with a 5-5 overall record after placing third in the Pacific Conference. After the game, Hastin delivered a message of positivity to his players in the final huddle, encouraging them to keep their heads up. "I feel like we accomplished some good things this season," he said. "We had some battles where we pulled off the victory. I just wanted to remind the guys about the positives of our season: Going 3-1 in league and having a winning record." The Tigers started five sophomores this season, Hastin said. They now lose three seniors to graduation on defense, but were otherwise a young group in 2018 that made legitimate strides after going 2-7 the prior season. "We were a very young team this season," Hastin said. "The future is bright, and I'm looking forward to it."